The odds are high that the Summit County condominium that you buy will not be new construction. It could have been built as early as 1972. That means up to 45 year old wiring, plumbing, fireplaces, windows and exterior siding and roof. Should that keep you from buying one? If you do buy, what can you expect as the building ages even further? Well, age hasn’t kept condominium prices from rising. 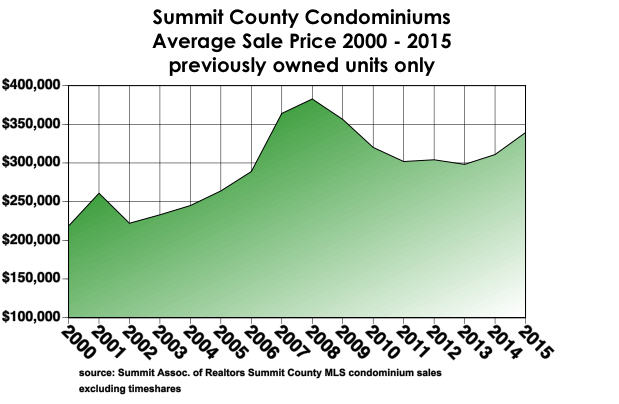 In the past 10 years, the average sale price for condominiums in Summit County has increased by 29 percent, even through the Bush Depression. Age obviously isn’t holding prices down. Then what’s going to happen to these old condominiums? The best-located ones might be bought out and torn down for new construction, but in the vast majority of locations, Homeowner Associations will have to invest in updates and improvements. And guess who pays for that? The good news is that when building-wide renovations are done values have always increased as much as the assessment, often as soon as the job is done. And most owners have stuck with the complex when major improvement projects take place; there’s been no mass exodus driving down prices. Several complexes have undergone such a makeover with great results. Silver Queen East and West, Summit Point, Deck Gore Range and several others have done major renovations and have increased in value. But many have not even begun the process and owners face expenses in the future. There is real value in buying at an unrenovated complex, as long as you know what you are in for. These complexes generally lag behind the curve of appreciation for a few years as owner sentiment builds for change. Improvements are generally paid for with a large special assessment (some have run as high as $20,000 per unit) because no association budgets for major renovations 40 years in advance. But as soon as the job is done, values increase. Buyers who want to avoid the cost or inconvenience of exterior renovation projects should stick to complexes that have already done the work or are new enough that it won’t be an issue for several years. But this later category is shrinking and every complex will face the renovation issue eventually. When evaluating these costs before buying or deciding whether to stay in a unit you already own, remember why you wanted a condominium in the first place. It’s more convenient to pay HOA dues than separate bills each month for water, gas, electric, cable, and maintenance. And it costs the same or less as well. Just because a condominium complex is aging doesn’t mean it’s a bad deal. Like any investment, it requires some attention to maintain its value.